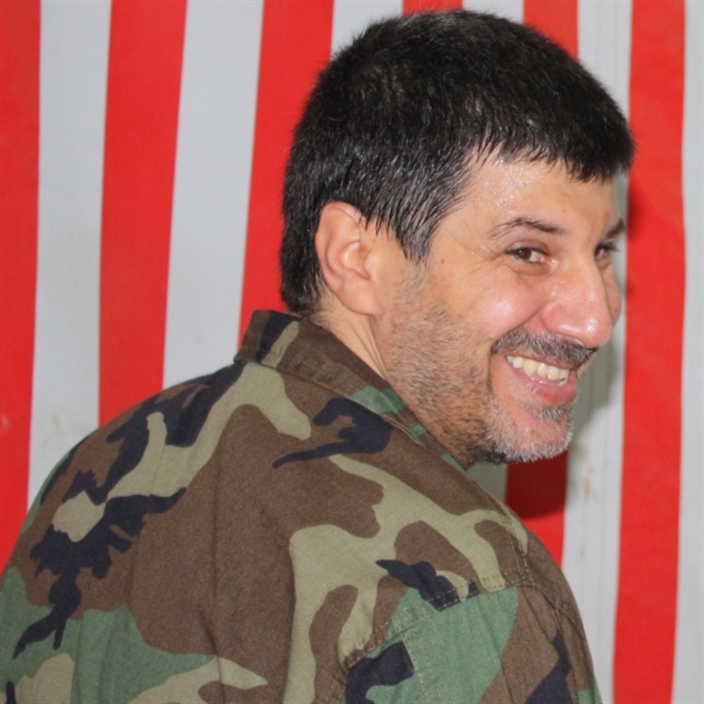 It has been 5 years since the assassination of a key Hezbollah figure and commander Hajj Hassan Lakkis. Hajj Hassan was a dreamer but with a special trait…determination. He had tried hard with all his spirit to make his dreams come true. His dream was a vision that motivated him to shape his thoughts into a powerful reality. Citing a close friend of Hajj Hassan and other sources, Al-Akhbar Lebanese daily published on Saturday, December 8 (2018), a lengthy article that disclosed some of Hajj Hassan’s character traits that made him “a man like no other”. “He returned from Africa in 1978, and since that time we were friends,” the fifty-year old friend said recalling the beginning of his relationship with Hajj Hassan. Lakkis was not only a senior commander in Hezbollah, he was also a life-long friend of Hezbollah Secretary-General Sayyed Hasan Nasrallah. “He has always been a brother, a loved one, an amiable young man and family,” Sayyed Nasrallah said during a memorial ceremony for Lakkis. Sayyed Nasrallah and Hajj Hassan Lakkis started out together as youngsters in Baalbek where they attended religion classes delivered by Sayyed Abbas al Mousawi, according to Lakkis’ friend. Later, in 1980, when Sayyed Nasrallah became the cultural official of Amal movement in Baalbek, Hajj Hassan joined him and stayed close to him during that period. When Sayyed Nasrallah got death threats, as a result of the public stances he took on the platforms of Baalbek, Hajj Hassan insisted to be by his side on all occasions. Since then, Sayyed Nasrallah and Hajj Hassan have built a special, profound bond of friendship which lasted through the years and everything else, Hajj Hassan’s friend said, according to Al-Akhbar. With the arrival of the Iranian Revolutionary Guards in Lebanon, Hajj Hassan was the first to enroll in the military courses they organized to resist the Israeli occupation. Subsequently, he moved to the Revolutionary Guards’ Staff Office where he was in direct contact with most Iranian officials. Hajj Hassan was a fast learner and a very intelligent young man, that he immediately acquired Farsi language. Given his position, Hajj Hassan was present in almost all the meetings Sayyed Nasrallah had with the leaders of the Iranian Revolutionary Guards, which provided him with high experience and a broader set of relations. Following the Israeli withdrawal to southern Lebanon and western Bekaa, the Israeli occupation had become concentrated in the area and all resistance operations had been limited there. At that time, Hajj Hassan participated in many of these operations that involved mounting raids on Israeli sites, one of which was in 1988 on “Tomat Neha” site. Fighting the enemy helped him detect some of the obstacles faced by resistance forces in battlefield. He sought solutions to overcome these problems. He first began adjusting and updating the Signal Weapon to stay abreast of new developments. He kept pace with everything new that would benefit the resistance. As a result, he became the primary technological reference to the entire resistance leadership. He was a diligent and hard worker. He took part in choosing the resistance’s missile arsenal and developed it. He expanded his research in this field until he became the first advisor to the military leadership every time it was presented with new weapons. Amid all the growing challenges and the enemy’s more complex and preventive tactics, Hajj Hassan had persistently sought ideas and solutions to overcome the challenges of land confrontations. He tried to figure out a way in which he could rely on the sky to overcome land challenges. “It won’t only take off. I’ll make it capture images as well. I might make it carry a weapon in the future, who knows!” Hajj Hassan would answer with extreme confidence, according to his friend. That ambitious young man, who believed that nothing’s impossible if you put your mind to it, decided in 1988 to break through the sky from his small room. He bought a chipper, collected small motors, stuck them to wooden pieces then tried to make them fly. After several unsuccessful attempts, Hajj Hassan eventually succeeded in making one of those prototypes fly. This is how he turned his simple designs into what’s known as the “unmanned aircraft” or “drone”. Hajj Hassan continued to work on the development of drones. For this purpose, he visited the aircraft factories in Iran. He attended several workshops there and met with many specialists in this field to benefit from their experience in developing domestic Iranian aircraft. Hajj Hassan’s accomplishment made Israelis more cautious of his forthcoming projects. They even tried to assassinate him in the early 1990s. They planted a bomb near his house in Baalbek, but it was through God’s will that he survived. Israel’s desperate attempt to assassinate Hajj Hassan, who posed an imminent threat to Israeli presence, hadn’t weakened his determination. He, instead, became even more determined to continue his work in both missile and aerial fields. Following Israeli withdrawal from Lebanon in 2000, Hajj Hassan’s work expanded and several laboratories, managed by him and his team, were set up for drone manufacturing. Sayyed Nasrallah used to visit these laboratories regularly to be brought up to date on developments in the field. During July 2006 war, Israeli enemy was still plotting against Hajj Hassan who had raised its concerns for the past years, and took advantage of 33-day war to try to assassinate him again. “I was busy at work,” said his close friend. “Hajj Imad Mughniyeh called me and said that he had just seen Hajj Hassan on television during a live coverage to an Israeli airstrike on a building in Shiyah. He asked me to go and tell him to leave the area,” Hajj Hassan’s friend said, referring to Hezbollah senior commander who was assassinated by Israeli Mossad in Damascus in February 2008. “As soon as I arrived, I learned that Hajj Hassan was trying to search the rubble for his 18-year-old son Ali Rida who was in the building before the strike. Hajj Hassan later told me that he went to the building to give his son a bag. But shortly after he left, an Israeli aircraft struck the building and destroyed it,” his friend added. After July 2006 war, in light of war’s outcome, work on drones continued and, as a matter of fact, was accelerated. Hajj Hassan took advantage of the scientific developments and the resistance’s capabilities to make new prototypes and meet post-war needs. The drones operated in Lebanon and Syria as well; they had helped in most of the confrontations that took place in al-Qusayr battle during the Syrian war. The martyr’s friend told Al-Akhbar that the latter had showed him a video how these drones were operating during the battle. They took pictures which were directly sent to the command room. The command room in return contacted the field group and informed it about the details of the place and the positions of the militants. The drones eventually helped save lives of Hezbollah fighters. “Following the battle of al-Qusayr, the martyr informed me of a new plan that aimed at arming the drone, enabling us to use it in filming and bombing. He reminded me of the time when he told me about this goal,” Hajj Hassan’s friend said. “Indeed, after a short period of time, he came back to me to show me a video of the successful maneuver in which the former plan was carried out,” the friend added. The Zionist intelligence service hired 12 Israeli Mossad agents, two of which were the shooters and the others took over the operation by planning, supervising and implementing at field level, to kill Hezbollah commander in Beirut suburb around midnight on Tuesday, December 3, 2013, according to Al-Akhbar. “As I arrived home, I was told that Hajj Hassan had called me minutes ago. I was about to call him back when his bodyguard called me and said that the janitor at Hajj Hassan’s apartment complex had called to inform him that someone had shot Hajj Hassan,” the friend recalls with a deep sense of anguish and distress. “I got there that night to find him leaning on the door of the car, smiling and the blood running from his head. When I came near him, I found the pistol in his hand,” he added. Hajj Hassan was martyred; yet, his unique thinking and innovative approaches will never fade away. The fruits of his hard work will live on forever, as well as his determination. Until this day, Hajj Hassan has not really been known neither by an enemy nor a friend. However, some of his achievements will be revealed in the coming war through air forces and drones of the Islamic Resistance- Hezbollah.